As part of my monitoring process, I review the list of dividend increases every week. This is in addition to the regular screening I do against the list of dividend champions and contenders. I use this exercise as a way to monitor how companies I own are doing, and potentially uncover any attractively priced opportunities that my screens may have overlooked. Many times, I end up uncovering quality companies for further research that fit everything I am looking for, except for valuation. As a result, I tuck those companies on a waiting list. If they ever get close to my desired entry price, I get an alert and review the situations further. 2) A history of earnings growth. I believe that a company that grows earnings over time can withstand a large number of headwinds working against it. 4) An attractive valuation. To me, this generally means a P/E below 20, coupled with a track record of earnings and dividend growth. A low valuation is not bullish in itself, if a company is not growing the bottom line. After going through the list of companies that raised dividends over the past week, I identified four companies for further research. As you can tell from looking at my stock analysis reports, I look for companies that can increase earnings per share over time. Rising earnings per share can essentially provide the fuel behind future dividend growth. For example, Colgate-Palmolive (CL) has increased dividends for 53 years in a row. The company has managed to increase EPS from $1.17 in 2004 to $2.72/share for 2016. This has allowed the company to increase annual dividends from $0.48/share in 2004 to $1.55/share. The rest has been invested back into the business, to fuel potential for more earnings growth. As dividend growth investors, our goal is to buy shares in a company that will shower us with cash for decades to come. One of the important things to look out for in our evaluation of companies involves determining the safety of that dividend payment. A quick check to determine dividend safety is by looking at the dividend payout ratio. This metric shows what percentage of earnings are paid out in dividends to shareholders. In general, the lower this metric, the better. As a quick rule of thumb, I view dividend payout ratios below 60% as sustainable. A lower payout is always a plus, since it leaves room for consistent dividend growth minimizing the impact of short-term fluctuations in earnings. For example, dividend king 3M (MMM) earned $8.16/share in 2016 and paid out $4.44 in annual dividend income per share. The dividend payout ratio is a safe 54%. This means that this dividend king is likely to continue rewarding its long-term shareholders with a dividend increase into the future. This will further extend 3M's streak of 59 consecutive annual dividend increases. However, there are exceptions to the 60% payout ratio rule. For example, companies in certain industries such as utilities have strong and defensible earnings streams. In addition, they can afford to distribute a higher portion of earnings as dividends to shareholders due to the stability of their business model. As part of my process, I tend to screen the list of dividend growth stocks regularly, in order to identify companies for further research. I also skim company press releases for announcements related to earnings and dividends. I was able to identify two dividend growth stocks, which seem to have been punished excessively as of recently. Those companies include Walgreen and CVS. Walgreens Boots Alliance, Inc. (WBA) operates as a pharmacy-led health and wellbeing company. It operates through three segments: Retail Pharmacy USA, Retail Pharmacy International, and Pharmaceutical Wholesale. The company is a dividend champion, which has managed to raise dividends to shareholders for 42 years in a row. The ten year dividend growth rate is 17.80%/year. Walgreens Boots Alliance has managed to grow earnings per share from $2.03 in 2007 to $3.82 in 2016. Forward estimates are for $5/share in 2017. Currently, the stock is attractively valued at 18.30 times earnings and yields 2.30%. Check my analysis of Walgreens for more information about the company. CVS Health Corporation (CVS) provides integrated pharmacy health care services. It operates through Pharmacy Services and Retail/LTC segments. The company is a dividend achiever, which has managed to boost its dividend for 14 years in a row. The ten year dividend growth rate is 27%/year. CVS Health has managed to grow earnings per share from $1.90 in 2007 to $4.90 in 2016. Forward estimates are for $5.88/share in 2017. Currently, the stock is attractively valued at 15.20 times earnings and yields 2.70. Check my analysis of CVS Health for more information about the company. As dividend growth investors we are trying to identify quality companies with an established track record of annual dividend dividend increases, which are growing earnings, have sustainable dividends, and are available at an attractive valuation. If we identify enough such companies to add to our portfolio, we will be able to generate a sufficient stream of income to live off in retirement. I identify such companies as part of my screening process, and as part of my monitoring process. As part of my monitoring process, I review the list of dividend increases every week. I go through this exercise, in order to check if the companies I own are going to pay me more for owning them. I also use it to uncover hidden dividend gems for further research. Most importantly, this exercise is helpful as an educational tool, used best to reiterate what we are really looking for as investors. The companies that recently announced their intention to reward shareholders with a raise include Honeywell International (HON), RPM International (RPM) and Northwest Natural Gas Company (NWN). RPM International Inc. (RPM) manufactures, markets, and sells specialty chemical products for industrial, specialty, and consumer markets worldwide.The company raised its quarterly dividend by 6.70% to 32 cents/share. 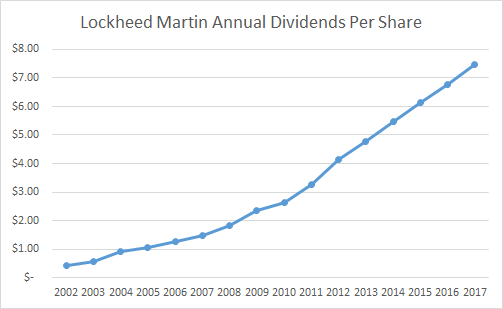 This marked the 44th consecutive annual dividend increase for this dividend champion. I was able to identify a few dividend growth stocks that I find to be attractively valued today. That doesn’t mean that these companies will not decline further in share prices from here. It also doesn’t mean that those are recommendations for you to act upon. These are just a few companies that I believe are attractively valued today, and are likely to grow earnings and dividends over the next decade or so. If that thesis plays out, it is also likely that share prices will grow over time. The J. M. Smucker Company (SJM) is a manufacturer and marketer of branded food and beverage products and pet food and pet snacks in North America. The Company's segments include U.S. Retail Coffee, U.S. Retail Consumer Foods, U.S. Retail Pet Foods, and International and Foodservice. The company is a dividend achiever, which has managed to increase dividends for 20 years in a row. Over the past decade, it has managed to boost dividends at a rate of 9.80%/year. Earnings per share grew from $3.03 in 2008 to $5.11 in 2017. The company is expected to earn $7.72/share in 2018. It is selling for close to 20 times earnings and yields 3%. It could be an interesting idea below $102 - $103/share. Check my analysis of J.M. Smucker for more information about the company. Hormel Foods Corporation (HRL) is engaged in the production of a range of meat and food products. The Company operates through five segments: Grocery Products, Refrigerated Foods, Jennie-O Turkey Store (JOTS), Specialty Foods,, and International & Other. The company is a dividend king, which has managed to increase dividends for 51 years in a row. 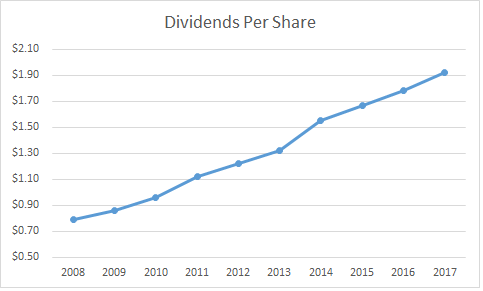 Over the past decade, it has managed to boost dividends at a rate of 15.30%/year. Earnings per share grew from $0.55 in 2007 to $1.68 in 2016. The company is expected to earn $1.56/share in 2017. It is selling for close to 20 times earnings and yields 2.10% It could be an interesting idea below $33 - $34/share. Check my analysis of Hormel Foods for more information about the company. The Walt Disney Company (DIS) is an entertainment company. The Company operates in four business segments: Media Networks, Parks and Resorts, Studio Entertainment, and Consumer Products & Interactive Media. The company is a dividend challenger, which has managed to increase dividends for seven years in a row. Over the past decade, it has managed to boost dividends at a rate of 18.80%/year. Earnings per share grew from $2.34 in 2007 to $5.76 in 2016. The company is expected to earn $5.81/share in 2017. It is selling for less than 20 times earnings and yields 1.60%. It could be an interesting idea below $105 - $106/share. Check my analysis of Walt Disney for more information about the company. Altria Group, Inc.(MO) manufactures and sells cigarettes, smokeless products, and wine in the United States. The company is a dividend champion, which has managed to increase dividends for 48 years in a row. Over the past decade, it has managed to boost dividends at a rate of 11.60%/year. Earnings per share grew from $1.49 in 2007 to $3.03 in 2016. The company is expected to earn $3.26/share in 2017. It is selling for less than 20 times forward earnings and yields 4.10%. It could be an interesting idea around $61 - $63/share, or below. Check my analysis of Altria for more information about the company.